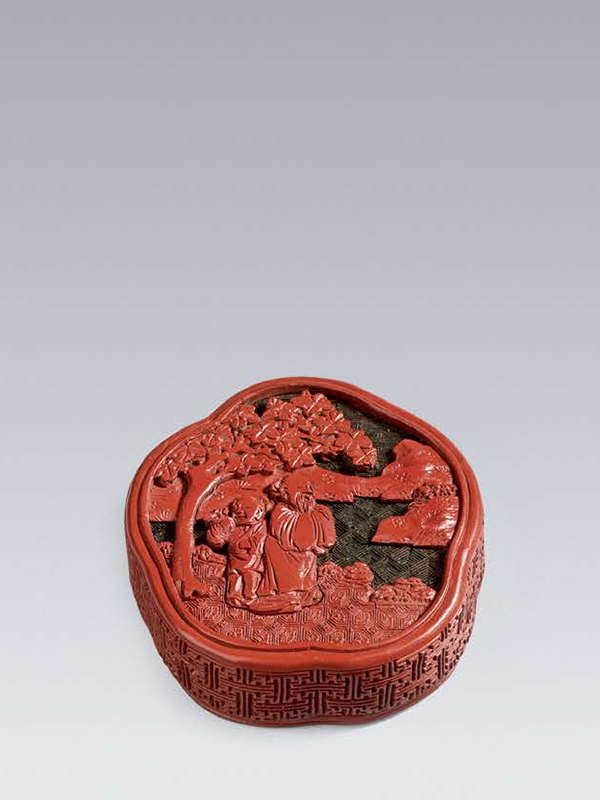 A cinnabar lacquer box of plum-blossom form with a flat-topped sleeve cover. The top is carved through a thick layer of green and red lacquer with a scene depicting a bearded immortal accompanied by a young boy in a landscape setting. They stand underneath a tree alongside the river with a mountainous setting around. The boy holds a spray of lingzhi in his right hand while the immortal’s hands are clasped together, hidden inside the sleeves of his voluminous robe. The straight sides are carved with a continuous design of interlinked wan diapers. 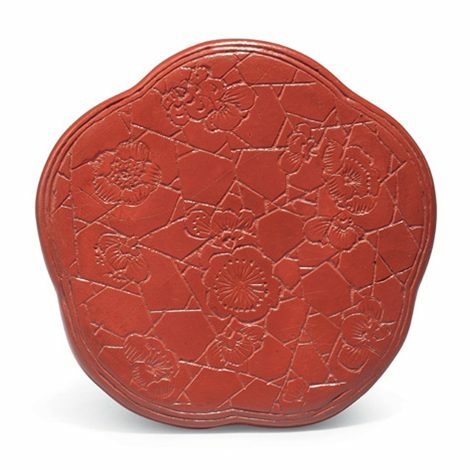 The flat base is engraved with plum blossoms on a ‘cracked-ice’ pattern. The interior is covered in a layer of black lacquer. This unusually formed box is imbued with auspicious symbols, not only in its plum form but also in the motifs that decorate it. The spray of lingzhi (wooded fungus) held by the boy is a wish-granting symbol and also represents longevity, since the fungus resembles the head of the wish-granting wand (ruyi). The base with an engraved pattern of plum blossoms on a ground of ‘cracked-ice’, signifies the beginning of spring and therefore the beginning of a new life. This motif became popular during the Kangxi period (1662 – 1722); the ‘cracked-ice’ ground was said to imitate the crackled glaze found on Guan ceramic wares of the Song dynasty (960 – 1279). A lacquer box with a similar ‘crackled-ice’ design as the main decorative pattern is in the collection of the National Palace Museum, Taipei. A slightly larger lacquer box of similar form also carved through layers of red and dark green lacquer, depicting animals in a natural setting, dated to the late 17th to early 18th century, is in the Derek Clifford collection. Another related lacquer box of similar plum-blossom form, decorated with melon motifs and dated to the 18th century, is in the collection of the National Palace Museum, Taipei.